In the afternoon the team works again on my favorite scene, the ‘killing mother scene’. Vocalists Aline and Annelinde have already dealt with their part last week. Now they rehearse it on stage with video projections, … and with the microphones. “Now everybody can eavesdrop on us”, Aline whispers as she gets her microphone put on. More importantly, next to all those scenic and technical additions, they will also rehearse the scene together with soloist Anna Linardou. The assignment for today is integrating and synchronizing Anna’s actions with those of the vocalists. The focus is above all on Anna’s dramatic movements. Wouter wants her to experiment with different possibilities so that every element contributes to the intensity of the scene. For today’s evening rehearsal, the team is completed by the instrumentalists of Blindman, lead vocalist David Moss and all the extras. All those people put together definitely results in more noise and energy. With a ‘SILENCE!’ from Wouter the repetition of the second scene can begin. David Moss enters the stage and while walking around between the rubbish, he introduces the main theme: the contemplation about the WHY? – Why have they done this to us? Who is responsible? … This scene is accompanied by percussion with stones on tables by Blindman. 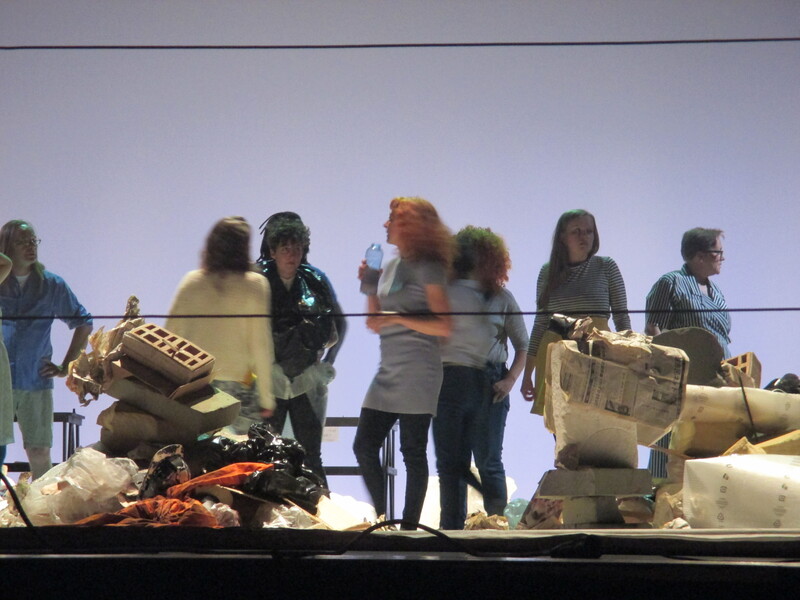 Soon David is joined by the vocalists and the extras searching their way amidst the rubbish, dragging and dropping things or building little structures. -there is no why here- doesn’t aim to deliver fixed interpretations, it is left to the audience to search for associations. This scene reminds me of the Trümmerliteratur, made by German poets after World War II, who - also searching for meaning - wanted to rebuild their language from scratch because they felt it had been polluted by all the horror. In the next scene all performers interact with targets projected one after the other on the screen. These bull's eyes are seen as if through the eyes of somebody who's operating a drone from a far distance – but with a real target. Each time something gets thrown at the target on the screen, an explosion follows. The group tries out the movements, throwing with enough power and aggression and doing this as a team. The scene ends by everybody beating stones together, what results in a kind of ominous effect. As, after the final note, somebody claps his hands once too often, Andrea laughs strictly: “From now on, the one who does this a second time, will pay drinks for the whole group!”. And with this joke another successful rehearsal has again come to its end.